As I get older and life's hustle and bustle minimizes my "me" time, I've learned to go for no-fuss, natural makeup looks. Honeybee Gardens has become one of my favorite brands for simple beauty basics I know I can rely on. They recently launched their Complexion Perfecting Blush, which I have in the shade Breathless. It's been my go-to pink blush this summer and this is just one of their products that's become a staple in my collection. It's no surprise then, I had to get their Buzz Box on its 1st birthday this month. 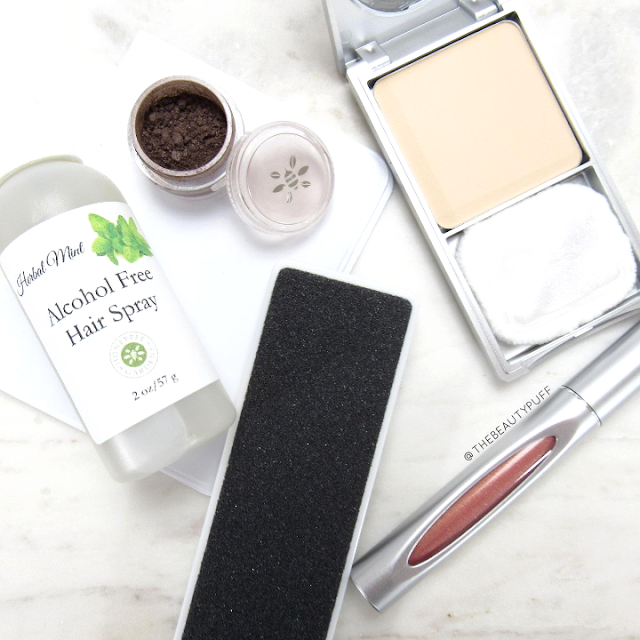 The Buzz Box is a combination of beauty products and tools for $24/mo with free shipping. The value is at least double that and you get to try a wide assortment of products. This month's box is fabulous as usual! *Recently Honeybee Gardens started providing color choices for a couple of the products included in the Buzz Box. This month, you could choose your foundation shade as well as lip gloss shade. The shades below were my personal choices based on skintone and color preference. Pressed Mineral Powder Foundation in Supernatural | $10.99 | I can't tell you how many times I wanted to buy this powder foundation. I always ended up picking something else or was too unsure of my shade. Well, this box gave me the perfect opportunity to finally try it! After all the liquid foundations I buy to get that "ideal" look, my oily never looks as fresh and natural as it does with powders. I'm hoping I fall in love with this one. Honeybee Foundation Compact | $12.99 | One of the things that really saves you money with the Honeybee Gardens foundation, is that once you buy the compact, you just get your refills and you're good to go! This compact comes with a mirror and puff so it's perfect for travel. So glad they included this. PowderColors Stackable Mineral Colors in Wanderlust (new!) | $7.99 | Another benefit of the Buzz Box, is being able to try new and exclusive products by Honeybee Gardens. I've always wanted to try one of the Stackable Mineral Colors and this one is absolutely gorgeous. It's a plum shade with a bit of brown and silver to give dimension. This is perfect for fall and I probably would have picked this shade myself! Alcohol Free Hair Spray | $4.99 | I've never tried any hair products by Honeybee Gardens so this will be new for me. This hair spray is alcohol free and has organic botanicals to nourish and keep hair shiny. It's a great size for travel or to throw in your purse for touch-ups. Absorbant Blotting Paper | $3.99 | How did they know? I always need blotting paper! These blotting papers come in a travel pouch that's plastic so it won't rip which is great. Mine are always getting squished in my purse or the packaging rips before the sheets are gone. This will solve that problem! Dual-Sided Callus Remover | $5.99 | Because who doesn't want smooth feet? This callus remover has a filing side and a sponge side. I would use this for travel because it's slim and would fit in my bag easily. A nice little addition and feels pretty sturdy. You can purchase the Buzz Box each month once it becomes available. Currently, you can get it without a subscription. Each box comes with a coupon that can be used on a future purchase as well! Check out the Honeybee Gardens website below and be sure to follow @honeybeegardens on Instagram for all the latest updates.